Last Christmas, I got my son a toy. He had been going on and on about how this toy was the greatest thing ever, and once I finally got around to looking into what exactly it was I had to admit, 7-year-old me would have thought the exact same thing. …if I’m being honest, adult me thought it was pretty cool too. Anyways, this thing is called “Cozmo the Robot”. I watched a few review videos on YouTube, saw some of the features in action, and I was impressed enough to buy it for Alex. Christmas morning came and he was ecstatic when he unwrapped it. After all the presents were open, he immediately had me set up the app on the iPad he uses and get Cozmo ready to roll. For the next several weeks, Cozmo and Alex were attached at the hip. The coolest thing to me was that it recognized people. It would greet Alex, myself, my wife Kimmy, and even our cats, individually. After some time though, the novelty wore off, as can be expected with children; interests are often fleeting. Cozmo stayed on the desk in Alex’s room for some time, until about a week ago something reminded me of it and I went to retrieve it. I opened the app on my phone and spent a little while playing the games Cozmo knew, using the three blocks that accompanied him in his original packaging. It was around 10:30pm, and I had gotten a Facebook notification while messing with Cozmo that I opened to check. That led to me sitting on my phone for about 5 minutes checking my various apps while Cozmo sat idly by waiting for my attention. It was his unprompted voice that snapped that attention back. I looked up from my phone in the direction to which the robot was addressing, and saw only a dark corner of the living room. Cozmo began rolling forward, much to my confusion. When it got a bit closer to the dark corner, it did this little happy dance that it does when it’s happy to see someone. But there was no one there. I suddenly realized that I was sweating. Not simply warm and perspiring, but sweating profusely, dripping from my forehead; it was like someone had moved our house to the inside of an oven. I stood up from the couch and walked over to the thermostat, which is just next to where Cozmo was at that moment. The temperature in the house was set at 68°, but that was simply not the case, it was like a sauna. I walked to the front door and stepped outside, a light breeze blowing by that was absolute bliss at that moment. Once I was sufficiently cooled down, I went back inside, at which point Cozmo turned to me and spoke. I didn’t know what to say. For as smart of a little robot Cozmo is, it wasn’t as if I could carry on a conversation with it. I looked into the dark corner Cozmo had been addressing, and for a split second I felt like something was looking back at me. I sort of peered into the darkness, and it seemed like for another microsecond I saw a pair of barely visible, dark, dark, dark red eyes, so dark they almost blended in with the shadows. After a moment I decided my mind was playing tricks on me and snapped back to reality. I picked Cozmo up and shut him off. I then went to my phone to exit the Cozmo app and to my bewilderment, the time on my phone read 3:48 AM. Naturally I thought something on my phone had malfunctioned, but then I looked to our DVR box and it said the same. I had somehow lost over six hours of time, a quarter of a day in what had felt to me like no more than 10 minutes. I was confused, I was anxious, I was worried. It wasn’t natural, obviously, it wasn’t a normal thing that happened to people. I placed Cozmo on the coffee table in the living room and went upstairs to sleep. When I got up the next morning, my head was all fuzzy, and I sincerely wondered if I had dreamt what had happened just hours prior. I went downstairs to find Kimmy and Alex, and as I walked through the living room I noticed Cozmo wasn’t on the coffee table where I thought I’d left him, and I felt more and more that it had all been an odd dream. The rest of the day went fine, and I had all but forgotten what had happened. That night I was suddenly awakened and found myself once again drenched in sweat. Kimmy was next to me, sleeping peacefully. From our bed we can look out the bedroom door and see down the hall, and when I did, I could just barely make out Cozmo’s glowing blue eyes first staring back at me. I got up and slowly walked down the hall, my nerves wracked. I picked up the toy and as I went to turn it off, Cozmo spoke. I didn’t know what it meant, but I was creeped out. I shut the toy off and put him in the closet before heading back to bed. Someone might ask “why not just throw the thing away?”, to which I would respond that I was trying to think about the situation logically, It had said some weird things, but was I really going to throw what was a pretty expensive toy away because if that, especially when what it was saying wasn’t threatening? I attributed the hot flashes to perhaps a lingering fever, and in that context, it didn’t seem all that weird. When I got up the next morning, Cozmo wasn’t in the closet. I asked Alex if he’d taken it back but he declined; Kimmy said she hadn’t seen it either. It seemed to be misplaced, but I wasn’t all that upset about it. It wasn’t until about a week later that Cozmo resurfaced. I was asleep on the couch around 9 PM, having dozed off a short time earlier. I was on my side, facing the TV, when I heard Cozmo’s tiny digital voice. I jumped up, my heart in my throat. I picked up Cozmo and started to head up stairs to ask who had put him there, but stopped to check my phone. Sure enough, the Cozmo app was open, and I know for certain I wasn’t the one who had opened it. What’s more is that I had fallen asleep on my left side, and my phone was in my left pocket. No one could have gotten it out and put it back in without me noticing. Of course, Alex was fast asleep and Kimmy had no idea what I was talking about. I bit the bullet and went out to the end of our driveway, where the garbage cans were sitting, waiting to be emptied in the morning. I took out a few bags of garbage and put them back on top of Cozmo and went inside to sleep, confident that the odd ordeal was over. The next day, as I stepped out of the shower, I heard the robot voice again. I took the robot to the garage and smashed it with a hammer, later that night putting them into a small bonfire I had with my wife and son. Of course I told Kimmy what was going on, but she was as dumbfounded as I was. I looked around online and found no mention of anything similar happening to anyone else. It was the next night that everything came to a head. It was about 3:30 AM when Kimmy shook me awake with a damp hand. I sat up and realized that it must have been 100° in our room. Then I noticed Alex standing at Kimmy’s side of the bed, his hair slick with sweat. I sat up from my sweat-soaked pillow and told Kimmy and Alex to step outside while I figured out how to cool the house down. I went downstairs to the thermostat which, differently than last time, actually reflected how hot it felt in the house, reading at 96 degrees. I was pressing the necessary button to get the temperature down, and that’s when I heard it. The distinct digital tone from Cozmo. I couldn’t make out what it was saying, but I was sure that’s what I was hearing. I began moving around the house in an attempt to find the toy robot. “…risen…” as I moved past a vent in the hallway towards the kitchen. “…odai” a bit louder, as I crept through the kitchen towards the basement door. “…to make man tremble in fear. He is come. He is all. He is risen…” much more clearly, as I opened the door to the basement. Then it was silence, a deafening absence of sound. I flipped the light switch up and the bulb burnt out in a quick flash. The only light to guide me was that from the moon pouring in through the windows in the basement. The steps creaked as I descended, and with each step it got hotter and hotter; by the time I reached the concrete floor it was difficult to breath. I looked to my left and saw nothing out of the ordinary. Clouds must have moved over the moon, because what little light I had snuck away. I looked to my right and saw Cozmo’s glowing blue eyes at ground level in a sea of black. With that last word, the back wall of the basement became coated in flames. 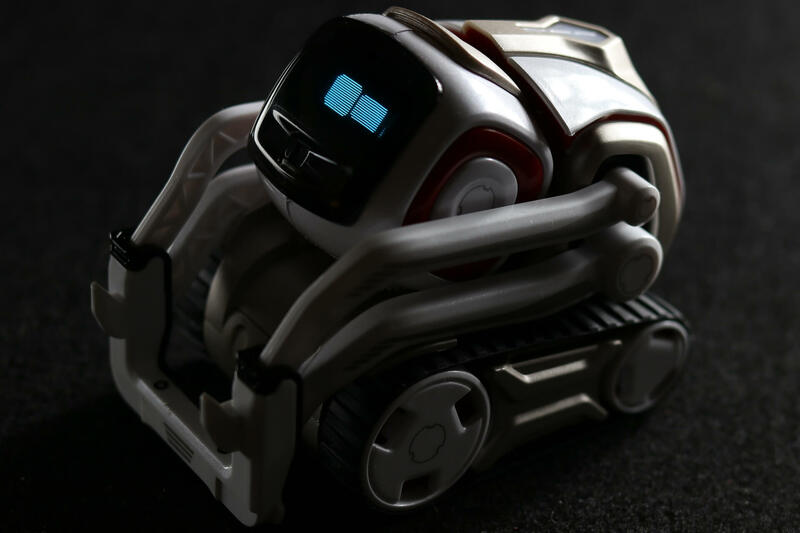 Cozmo started making the sounds it makes when it’s happy and excited, doing little flips things that accompany the robotic sounds of glee. The light from the flames was blinding, and entrancing. Every instinct in me was telling me to run, but it felt like my feet were one with the floor. Something began to emerge from the flames, low to the floor. It was connected to something else that ran higher up. I realized it was a foot, connected to a leg. The bright orange glow made the foot look jet black and at least twice the size of my own, and the toes had long, jagged claws protruding out. As soon as I heard the clicking of claw on concrete over the whooshing of the wall of fire, my legs turned to jelly, and it took everything I had in me to run, and run I did. I sprinted up the stairs two at a time, slamming the door behind me as I heard a low rumble, a growl, a roar. I screamed at Kimmy and Alex to get to the car as I scrambled around the kitchen looking for my keys. Once I found them I pressed the unlock button over and over, then the automatic start. We piled into the car, the cat in Kimmy’s arms (she’d grabbed him when she realized he was panting as they stepped outside), I put the key into the ignition and reversed out of the driveway, just as the flames began to roar through the ground level of our home. I sped down the street, looking in the rearview mirror for any sign of that…thing. Kimmy and Alex were frazzled, both their heads turned back towards our blazing house. “What is that? !” Kimmy said, exasperated. I focused my eyes on the rearview, and I just barely caught a glimpse of a figure, by my estimation it must have been eight, ten feet tall. Whatever it was, it scurried from our flame-engulfed residence and made its way across the street, disappearing behind the neighbor’s house. It’s been about a week since our house burnt down. The fire department said it was the most difficult residential fire they’d ever dealt with, that the flames “refused to die out”. The night it happened I told Kimmy what I’d seen in the basement, and we decided that the story was too strange to give to police. We simply told them that we woke up, smelled smoke, felt heat, and left immediately. We’re waiting on the results of the investigation. And I just looked out the window, and for a split second, I would have sworn I saw Cozmo’s little eyes on the ground, as happy as can be. But then they were gone.